The Seahawks entered this last decade stretch in the middle of a string of four straight losing seasons. Of course, because of the overall ineptitude of the NFC West over that span, that stretch also included a division title in 2010 at 7-9 and even a playoff win, thanks to Marshawn Lynch. And then in 2012, the Seahawks drafted Russell Wilson, and nothing has ever been the same. Starting in that year, Seattle has gone 75-36-1 with three division titles, four second-place finishes, and six playoff appearances, including a Super Bowl win in 2013 and a Super Bowl loss in 2014. The team is in a bit of transition now, with the Legion of Boom moving on and little beyond Wilson and Doug Baldwin still there from the best days, but it’s still been one heck of a run. Let’s take a look at the best Seahawks fantasy seasons of the last decade. Wilson was the QB1 in 2017, but it wasn’t that dominant a season — it’s only 14th overall over the last decade and would only have been QB1 in 2010 and 2012 in addition to 2017. That said, Wilson was the runaway QB1, topping No. 2 Cam Newton by nearly 50 points. 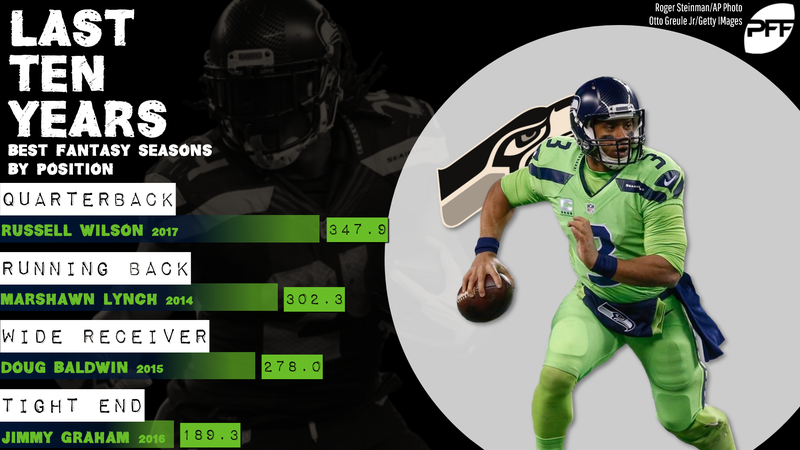 Wilson had more passing yards, fewer interceptions, and as many passing scores in 2015, and more touchdowns and fewer interceptions in 2018, but his 2017 output also included the three scores that put it at the top of his impressive-so-far career. Chris Carson had a great 2018, rushing for more than 1,000 yards despite missing two games and making the Seahawks look like geniuses for taking him with the fifth-to-last pick in the 2017 draft. It also was only the fifth-best Seahawks RB season over the last decade (behind four Lynch seasons) and a full hundred points behind Lynch’s 2014. Lynch had more yards in 2012 but set career-highs in both rushing and receiving scores in 2014, marking his best overall season. It was also the second of two straight seasons with a PFF grade over 90.0, tough to do in its own right. Baldwin had been a perfectly serviceable receiver over the course of his career prior to 2015 and was basically only that entering Week 12 of 2015 as well — through 11 weeks of the season, he had 539 yards and 3 touchdowns and was WR33 in PPR leagues, behind such luminaries as Donte Moncrief, Jordan Matthews, and Tavon Austin. Then the rest of the season, over six games Baldwin nearly doubled his yardage (530 more yards) and added 11 touchdowns, including 10 over a four-game stretch Weeks 12-15. He was WR3 down the stretch, kicking off a very successful three-year run in which he topped 200 fantasy points every year. That ended with an injury-plagued 2018, but a healthy Baldwin in 2019 could be a big producer again. Jimmy Graham in New Orleans was a true gamebreaker, the most dominant force at the position we’ve seen outside peak Rob Gronkowski (and just barely outside him, at that). Jimmy Graham in Seattle was … fine. He played three seasons there, topped 2,000 receiving yards, and scored 18 touchdowns. He came back from a patellar tendon tear in 2015 in time for the start of 2016, which ought to have been impossible. He was still a very good tight end. He just wasn’t “Oh my god it’s Jimmy Graham.” It was good enough to lead Seattle’s decade, though.